Plant growth and development are adversely affected by salinity – a major environmental stress that limits agricultural production. 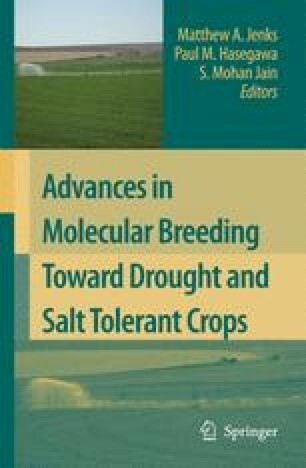 This chapter provides an overview of the physiological mechanisms by which growth and development of crop plants are affected by salinity. The initial phase of growth reduction is due to an osmotic effect, is similar to the initial response to water stress and shows little genotypic differences. The second, slower effect is the result of salt toxicity in leaves. In the second phase a salt sensitive species or genotype differs from a more salt tolerant one by its inability to prevent salt accumulation in leaves to toxic levels. Most crop plants are salt tolerant at germination but salt sensitive during emergence and vegetative development. Root and shoot growth is inhibited by salinity; however, supplemental Ca partly alleviates the growth inhibition. The Ca effect appears related to the maintenance of plasma membrane selectivity for K over Na. Reproductive development is considered less sensitive to salt stress than vegetative growth, although in wheat salt stress can hasten reproductive growth, inhibit spike development and decrease the yield potential, whereas in the more salt sensitive rice, low yield is primarily associated with reduction in tillers, and by sterile spikelets in some cultivars.